Manulife Asset Management Services Bhd won twice at The Edge-Thomson Reuters Lipper Fund Awards 2018. 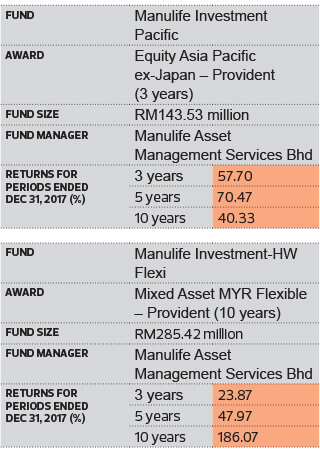 Its Manulife Investment Pacific fund came out tops in the Equity Asia-Pacific ex-Japan (Provident) three-year category while Manulife Investment-HW Flexi took home the prize for Best Mixed Asset MYR Flexible (Provident) in the 10-year category. CEO and executive director Jason Chong attributes the fund house’s performance to its investment philosophy and processes. “Our investment philosophy is based on what we call our GCMV criteria, which stands for growth, cash flow, management and valuation. We invest in companies with solid and scalable business models, good earnings potential, steady cash flows, solid balance sheets and backed by strong and driven management teams,” he says. On Manulife Investment-HW Flexi, head of total solutions and equity investments Tock Chin Hui says, “The fund’s investment objective is premised on a total-returns basis, where we invest primarily in quality, with relatively less exposure to small-cap stocks. “We intend to deliver positive returns in all market conditions (and not merely to outperform the benchmark). This is achieved by employing active management and an investing strategy based on bottom-up research with a top-down overlay, where we identify themes, sectors and stocks from which excess returns can be derived. On Manulife Investment Pacific, Tock says the fund’s objective is to capture capital appreciation via country allocations, overlaid with a good balance of growth and income stocks across multiple industries. “Country allocation and stock selection in key themes such as technology, infrastructure and rising consumerism were the key drivers of the fund’s performance,” she adds. Overall, Chong thought 2017 was an exciting year for the firm as its assets under management (AUM) grew 38% against the industry average of 19%. The growth was due to the strong sales of its existing funds, driven by the fund house’s superior returns. This year, the Malaysian market is expected to be underpinned by strong exports, rebounding commodity prices, improved private consumption and possible infrastructure spending. “We expect corporate earnings growth momentum to pick up as many are well positioned to benefit from the anticipated recovery in global demand, following the capacity expansion of the past two years,” says Chong. On the wider 2018 Asian investment ecosystem, Manulife continues to be positive on equities in the region. “We expect earnings momentum to follow through on the back of an economic recovery which, in turn, will drive markets in Asia,” says Chong.